As you many know, I've recently started a very cool new job and am working full-time. So, I have less time to blog. Lucky me, the lovely Jessi Peck of Sweetie Pie Bakery will be joining us here on Adventures in Dressmaking regularly to share her sewing and clothing projects! Here's a little bit about Jessi! I am a temporarily retired interior designer with a love for all things sweet, be it voille or vanilla. Taking a break from work to stay home with my kids while they're young has been really important to me and I'm so grateful to have the opportunity. However, not long after making that decision I needed a creative outlet and a need to design more than the stack of receiving blankets in the nursery. 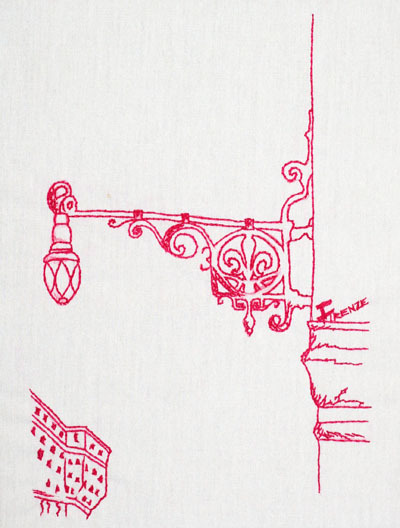 My love for architecture and sweets led to my first pattern line, Sweetie Pie Bakery. These felt patterns are inspired by my children and developed from hours on the playroom floor. Now that my kids are getting lives of their own with preschool and play dates, I decided it was high time I ditch the yoga pants. I hope you enjoy following along as I join Suzannah in her Adventures of Dressmaking! Jessi has prepared a tutorial of a super fun sweater refashion/embellishment for us. Here it is! I've had this sweater for years. My husband actually got it for me for Christmas one year, before he was even my husband. Now two kids later it was still hanging in my closet. The sweater was soft but just didn't have the same allure it seemed to have when I first lifted it from the gift box. The sweater was a bit too short so I thought a peplum would give it some length, and a bit more color. To give it even more panache, I decided to add elbow pads and pom poms! This sweater is super fun to wear and comfy with a pair of yoga pants at home. I love that scraps can make an old sweater beautiful-and as a bonus, get me out of pjs! The first thing I did was cut a 3" strip from some shirting fabric. I measured the perimeter of the bottom of the sweater and a little less than doubled that. I serged the ends of the shirting fabric and then sewed the ends together to form a loop. Then I ran a basting stitch to gather the top of the peplum. I Measured 3/4" up from the bottom of the sweater and drew a line so that it was an easy guide to pin the sweater to. After adjusting the gather I sewed the peplum to the bottom of the sweater. For the elbow patches, I cut ovals of wool felt and hand stitched them into place. I suggest pinning them on and trying the sweater on first to check the placement. I did make sure to measure up from the cuff to the bottom of the patch on each sleeve to make sure they were even. For the hood, I ran my chunky yarn through the old casing with the aid of a safety pin. I left the ends extra long so that I had plenty to tie onto the pom poms. I thought big pom poms would be super fun so I wrapped the yarn around 4 fingers and probably went around 50 times. (here is a tutorial on making pom poms) That's it! Can't not have a jumping photo with bouncy pom poms! Super cute, right? I love the bright elbow patches! Thanks, Jessi, for sharing with us! Readers, be sure to check out Jessi's blog as well. Have you done any sweater refashions lately? 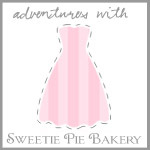 Look for more Adventures with Sweetie Pie Bakery later! 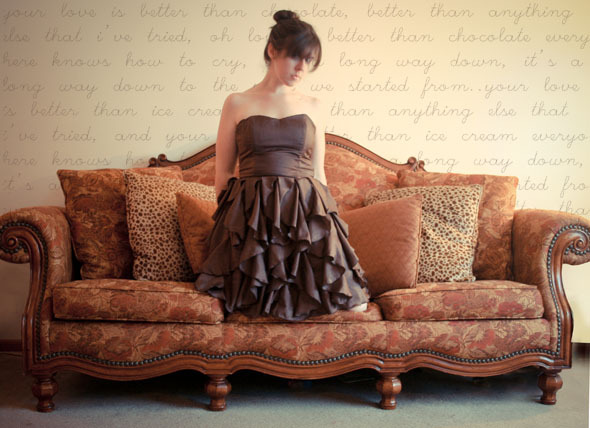 Oh, I need to see how she made that brown party dress. It's breathtaking. Nice!!! 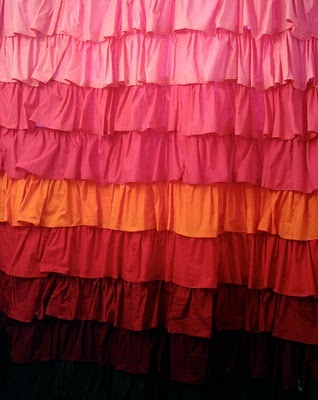 I love ruffles!! The brow dress is just lovely!! I really want to sew patches onto the elbows of my sweaters now!!! I love that look. I'm so in love with that party dress! Gorgeous!! Thanks for the tutorial love the pom poms! I am in LOVE with the party dress!